Bedfords Park Visitor Centre01708 748646work Nature ReserveBedfords Park covers approximately 215 acres and provides a range of important habitats for wildlife. Of particular note are the 'unimproved' grasslands supporting a wide variety of wild flowers and insects; the mature woodland, home to all three species of woodpecker, nuthatches and other woodland birds and the ponds and lake which provide homes for newts, toads and waterfowl. The deer park to the west of the visitor centre has a herd of Red Deer in commemoration of the days when King John used this area as a hunting ground. These deer are managed by the London Borough of Havering. You may be lucky enough to see one of the wild Fallow, Roe or Muntjac deer that live in, or pass through the park. The Visitor Centre opened in June 2003, was built on the site of the former mansion and later cafe. It incorporates many sustainable features by re-using parts of the earlier building, using high insulation and modern roof design such as the suspended stonecrop roof. 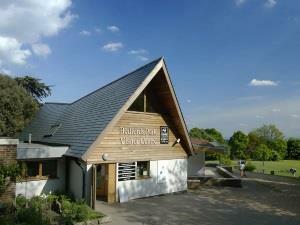 The Essex Wildlife Trust Visitor Centre is open7 days a week, 9-5pm (4pm during winter). Closed Christmas Day and Boxing Day, but open all bank holidays. Bedfords Park covers approximately 215 acres and provides a range of important habitats for wildlife. Of particular note are the 'unimproved' grasslands supporting a wide variety of wild flowers and insects; the mature woodland, home to all three species of woodpecker, nuthatches and other woodland birds and the ponds and lake which provide homes for newts, toads and waterfowl.